Just getting to the starting line of this race was an adventure, or should I say a series of unfortunate events. I first lost a teammate to appendicitis, instead of to more obvious shoulder problems. Other potential teammates fell to the flu, a torn LCL, and at that point I refused to let anyone else consider it, for their own safety. I had my own share of unfortunate events in the last few weeks – a run-in with barbed wire on an O-course, endo’s off of my bike, and endo’s while trail running. The day before the race, just hours before I hit the road, I learned the accommodations for a group of us were double booked and I had to find another place. On the drive to the race, I faced torrential rains and high winds. About an hour from the check-in, I had to take a detour to a dealership to figure out why my truck had suddenly started to cough and sputter when I tried to rev beyond 2,000 rpm. But eventually I made it to the pre-race checkin – with just 8 minutes to spare. Steve Morrone, the race director, was kind enough to give us the race maps and most of the UTM coordinates the night before. That enabled me to stay up much later than I would have otherwise, to prepare for the race, of course. The map was a thing of beauty in itself. It was bigger than any table in my hotel room. Maybe bigger than most tables anywhere in the hotel. And certainly bigger than the hood of my truck. Like most racers, my map case will hold one sheet of 8.5×11 paper. If it’s thicker than that, it can’t be quite that wide. How do you spell origami? Race day dawned with more rain, but at least it was relatively warm – mid-60’s. The forecast called for temp’s to fall during the day, down to the low fifties by evening. That was about perfect. The high wind forecast – 30 mph with gusts to 50, wasn’t so appealing. By the time we arrived at the start, the rain had stopped. Steve had announced the night before that the high winds were too dangerous for the paddle section, so it was being dropped. 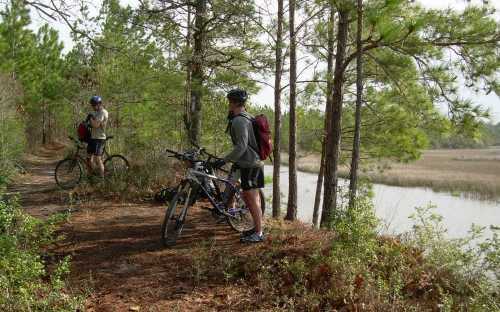 We were getting some extra biking mileage to get to what would have been the paddle to bike transition area. 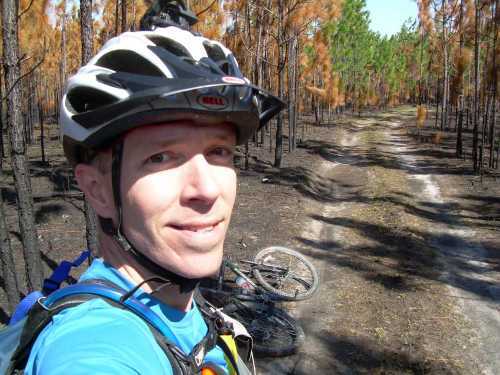 He had marked on the maps the route we had to bike to that TA, in order to stay off of heavily traveled US 17. Travel along 17 was prohibited – we could only cross it. Fair enough. I hung out at the start line with fellow TrailBlazers RDU chapter members Sheila and Shelly, Team “Slow and Steady”. Bruce Dale and Dale Long were there to, racing as Team “Five-O Racing”. 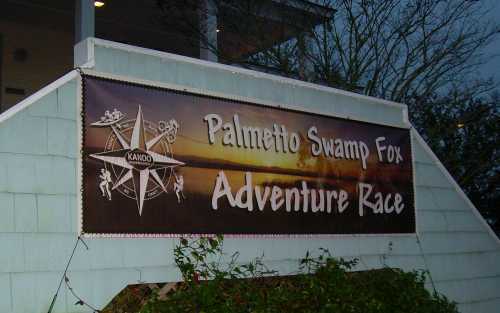 Matt Tabor and his team “NC Adventure Racers” were also there. I know there were others from Raleigh, but I’m not sure if there were any other TB-RDU members there or not. There were just over 100 racers in attendance, many of whom I’ve met briefly at the races I’ve put on. Steve started us off by having teams use their 10-20 feet of 10mm rope to tie each teammate to the other members of the team. Solos had to wrap the rope around our necks. We were all given a map of the historic district of McClellanville and directions to 6 checkpoints. We had to run to each CP, write down a letter-number code found there, then come back and use the code to find 6 letters off of a chart. Then we had to unscramble the letters to answer a question before we would be given our passports for the rest of the race. The passports were nice. They were 8.5×11 sheets of paper laminated with a coating as stiff as a driver’s license. It was probably bombproof. I almost strained something trying to fold it in half to fit it into my pack. It certainly wasn’t going to return at the end of the day looking like a soggy wad of paper pulp – which makes life easier for whoever has to verify results (been there). Having already plotted all of the CP locations, except for the orienteering course that we would do from CP 12, several of us were thinking of doing the course in reverse order from how they were numbered. That would put the foot section earlier in the event, while our legs were fresher. Steve nixed that idea because he might not be able to get volunteers out to CP 12 and set up before racers would arrive. So after the historic run, teams pedaled off along the same route. The sun was starting to chase away the clouds by this time, and it was looking like a great day. The westerly winds were directly in our face, as they should have been. I was just hoping that it would blow in the same direction for the afternoon’s ride back along this same road. The paved road eventually gave way to a sand road. It gave way shortly thereafter to a soft sand road. A few miles of that, with more headwind, and some of the teams were starting to lose steam. I had planned to hang with Sheila and Shelly for a good part of the race, but the adrenalin of being able to pass other teams got to me. Sheila had already told me to go ahead if I wanted to, so I didn’t feel too bad about it. I was racing in a different category from them anyway. At the end of the road we were on, we should have found US 17, and been able to cross it into Buck Hall Recreation Area where we would pick up the Palmetto Trail. There were some side roads that cut the corner, so I decided to try one of them. Another team was coming back up towards me, so I figured they were thinking the same thing. When we got to 17, we could see the entrance to Buck Hall, but it was a quarter mile away to the right. They turned around instead of traveling along 17 to get there. I made one of my impulsive moves of the day and crossed 17 and went down a dirt road on the other side. If I was where I thought I should be, I would find a small road to the right that would lead me to the trail. I didn’t find the side road, but I did find a pit bull and a golden retriever who thought it fun to bark and chase me down the road for a quarter mile. I eventually yelled at them enough that the golden stopped running, at which point the pit bull did too, thankfully. That left me near a powerline, which fortunately had a well used trail under it, heading in the direction I wanted to go. So I followed it. The powerline trail brought me out on the road into Buck Hall, and I saw a couple of teams riding down the road towards the location of TA 2, which was no longer needed. I continued along the powerline and found more teams at the trail/powerline intersection, studying their maps. I already knew I wanted to go right on the trail, so I just rolled by them and headed off down the trail. The Palmetto Trail here was really nice, pine needle covered tread winding through a palmetto and pine forest. I soon came to a small bridge over a creek – neither was on the map, and met a team of three who were dismounting their bikes. Because they stopped, I did too and that’s when I noticed the control hanging under the bridge. We’ll call this “race magic”, when a fortunate bit of being in the right place at the right time occurs and saves you from making a big mistake. I would have missed the control had they not been there. Turns out one of the guys was Jack, the RD for the Poker Run AR, another race in the this year’s TrailBlazers Sprint Series. I rode with these guys most of the way to the next CP, but left them when they stopped to map read at a turn in the trail. I think having my map folded and hanging where I could read it and ride helped save me some time. I saw a lot of people stopping to read maps during the day. The next few CP’s were hard to miss. With three of four teams’ bikes and people milling around, you couldn’t miss the turns to the CP locations. Had I been the only one there, it would have been much more difficult to spot the right locations, so I’ll call this more “race magic”. Most of the control placements were out of sight of the main trail, and the 1:24k scale maps were not exactly full of landmark details. After our train of teams crossed back over 17, and contined along the Palmetto Trail, the nice pine needle covered trail changed to root soup. We had puddles, no, sections of trail that held standing water 4 to 8 inches deep. At least the bottom was solid and we just splashed through, throwing black water all over us. There went the dry socks! I passed a few more teams who were map reading as we made several more road crossings. Eventually I reached a trail intersection that wasn’t clearly marked on the map. I knew I was near an option to leave the trail and hit some roads to save time. Instead of hesitating with the group of teams, I took a left turn and zipped away on my own. A few of them followed me shortly, and caught up as I realized this just brought us out to 17 and the road we were looking for was to the right several hundred meters. This team had raced the last Gold Nugget and knew me. We reluctantly turned back and rode the trail back to the last intersection before going the other way. We didn’t want to risk a DQ for traveling on 17. The fact that there was a trooper, with blue lights flashing, parked in the middle of that few hundred meters might have helped us decide to behave. At the next road crossing, I decided to go left and continue my earlier plan of using the road to save time. It was longer, but the trail could be slower, especially if it was rooty and flooded like the previous sections. No one followed me. Along the road I found even stronger headwinds than before. I think that killed any advantage I might have gained. As I neared the spot where the trail came out, I saw teams that were just behind me on the trail earlier. They were just ahead of me now. Oh well – mental note to self to think about wind direction before taking open road section again. At the next CP I passed some teams as they dallied at the CP. The teams I had been closest to didn’t dally, but they weren’t busting it on the ride either. I passed two of them and kept rolling. By now I had been out for almost 2.5 hours and my 2 hour bottle of Perpetuem was empty. I thought about continuing on, but knew that I would need the energy later. I stopped and mixed up another bottle, and watched these teams pass me again. I don’t think I caught them again, certainly not before the O-section. Note to self – find a faster way to refill the bottle. CP 7 was along a creek, between two roads that met at angle. There were several teams there looking for it with no success yet, so I went around the corner to the other road to attack it from a different angle. Their numbers prevailed and they found it before I did, but I heard the shouts and soon had it punched too. The next CP was about 9 feet off the ground. There was a wire ladder, with 6″ long rungs, stretched between the tree and the ground, at almost a 45 degree angle. If I’d had a teammate, I could have hoisted them up to punch the card. As a solo, I would have had to hang from the ladder with one hand, hold the passport with the other, and operate the punch with … Ok, so here’s a good reason for a bombproof passport – I could hold it in my teeth while I jumped up, grabbed the one tree limb within reach, wrap my legs around the tree, lean over with my head and get the passport within reach of the punch. Voila. I saw the team there before me head off to the east on an old nearly overgrown track, but it wasn’t on the map, so I backtracked to the last intersection and followed a road that was on the map. It came out on a paved road, as expected, but there was another sand road across to the right. The map said it should have been left. Two other guys disappeared up it, so I took a chance and did so too. I was starting to drag at this point, so I never caught them. This was about the time I decided that four Endurolyte capsules per hour wasn’t enough. I had a few muscle cramp tweaks every now and then, so I decided to up the dosage. It helped, and I kept going. I think the next section involved a long grinding ride of 5 or 6 km’s to get to a few more CP’s before we reached CP 12 and the TA. With no one to talk with to help pass the time, this was not a particularly fun section. It eventually passed, but not before having to face killer headwinds that nearly stopped my in my tracks. 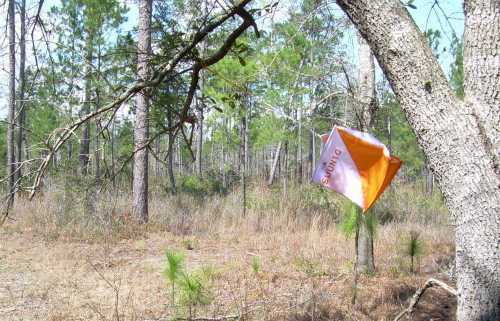 I took a great picture at CP 10 where the wind was blowing the control flag out sideways from the branch it was tied to. It was disheartening to watch my bike speed drop by a third in a split second just because of a wind gust. At the TA, we had to stick a tossed tomahawk in the target twice before they would give us the O-course UTM’s. I messed up the first three tries, but on the fourth I got the technique right, and the fifth try stuck too. I tried for number six to see if I really had it, but it bounced off. Don’t get cocky. We had 5 UTM’s to plot for the O-section. One of the other racers there asked if they had to be done in order, and the answer they were given was yes. I learned that many other teams did it in the opposite order, which might have been easier, but who knows. I went in numerical order, and the first leg was a straight shot about 2.5 km down a road. My legs were not recovered enough to run yet, and my back was feeling a bit tight, so I alternated some jogging with fast walking. At that first CP, I met the team from the Gold Nugget again, and we went together to the next CP. It was another case of “not all roads are on the map”. The UTM plotted 500 meters from any road, but there was a road bed that led to it. We saw Bruce and Dale coming out as we went in to it. From there we could bushwhack 1 km to the next point, or run 5+ km around by the roads to get to it. Another team there said they’d just spent 15 minutes and couldn’t get through the brush and briars. We tried for 10 minutes and then decided to go back to the last major road and try another old roadbed we’d seen. It soon gave out but we were closer, so we tried to punch through again. The briars just got too thick for us, so we would go a little further left and try again. We repeated this until we finally found a thinner spot we could scratch through. On the other side the vegetation opened up and we looked for the backstop road we were expecting. We kept going and didn’t see the road, and didn’t see the road, and didn’t see the road. By now it had been about 40 minutes since we left the last control. Then we spotted the control up head!! Then we saw the road bed. What luck!! Had we punched through the briars sooner, we might have missed the road altogether and really wasted some time. In the end, I’m not sure we gained any time on teams that ran back around, but it was fun to have lived through the briar bushwhack experience, and to feel the elation of coming out right on the CP. I wasn’t up to running anyway, so it worked for me. At this point, the team I had bushwhacked with kept walking and I decided to jog again. The slower bushwhack pace must have loosened me up and rested my legs. At CP 16, I had the option to bushwhack a half km, or run roads for 2km. 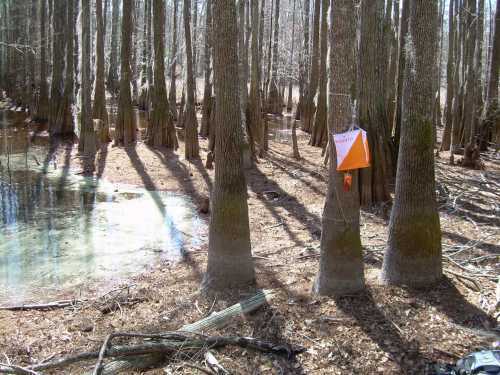 The map placed a symbol for swamp in between, and after the last bushwhack experience, I chose not to try it. Bruce and Dale did it, and reported than the water was only mid-shin deep. I missed an opportunity there. Oh well. I passed two teams on the last jog back to the TA, and left out just before them. 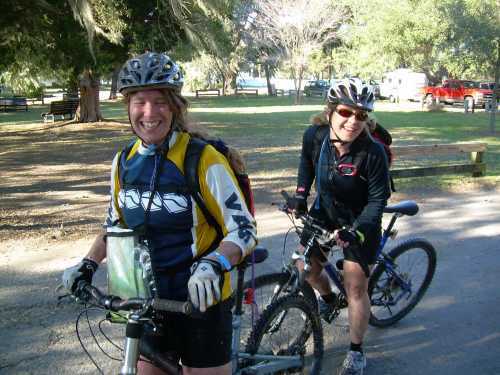 I stopped briefly on the road to chat with Sheila and Shelly as they were heading to the last O-course CP. The other teams passed me but I caught up again and drafted with them for a while. I lost some ground against them at the next CP’s, partly because I had to take my pack off to get the passport out, and partly because I was starting to drag again. I pushed on as much as I could, trying to not to cause a cramp and still trying to keep up with them, although they weren’t in my category. They were just a good measure of my progress against the clock. As they headed off on a side road to get the last CP, I enjoyed a final emotional boost. I had picked up this CP on the initial ride out, so I didn’t have to stop for this one. This gave me the chance to get several minutes ahead of them and out of sight. The homestretch adrenaline kicked in at this point and I hammered the pedals as hard as I could. Ok, it was more of a hard push with some worry about cramping, but it was close to all I could give at the time. I noticed that I managed to maintain a higher speed than I had all day, despite some headwind, and that encouraged me too. I did stop once to pop four more Endurolytes before I crossed 17 for the final 2 km to the finish. The headwinds picked up even more in the last 500 meters, just to whip me one more time, but I made it in anyway. I did it! Steve had a guy with a laptop taking the passports and verifying results and entering them in on the spot. They had a 30 inch monitor set up so you could see the results. Very nice. It showed me that I was the third Solo to come in – even nicer!! That was pretty amazing considering all the training I had not done. Can’t wait to see the final numbers to see if I would have had a shot at 2nd if I had not made all the mistakes I did. My watch said my total time on the course was 8:28. After a change of clothes, I hung out with the other finishers and ate cookies, drank gatorade, and tried to stay in the sun and out of the wind as much as possible. We clapped for the other teams coming in and waited for the shrimp creole to be served. I know I made several mistakes on the course, but I think you have to go make them in order to learn from them. It was a lot of fun, even if I did have to race solo, and I’ll probably do it again next year. Maybe we’ll get to paddle then!